Noopept, or N-phenylacetyl-L-prolylglycine ethyl ester, is a synthetic nootropic molecule that has been known to improve various aspects of cognition including working memory and attention. The effects of noopept are similar to those of racetams such as piracetam. The effects of noopept are similar to those of racetams such as piracetam. 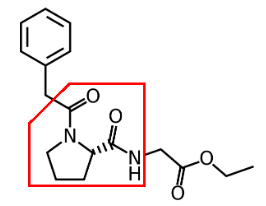 While the chemical structure is not technically defined as a racetam, the structure is similar to racetams in that a piracetam-like structure is contained within it, although noopept does not have a pyrrolidone nucleus. The chemical structure of noopept. A racetam-like structure is contained within a noopept chemical. 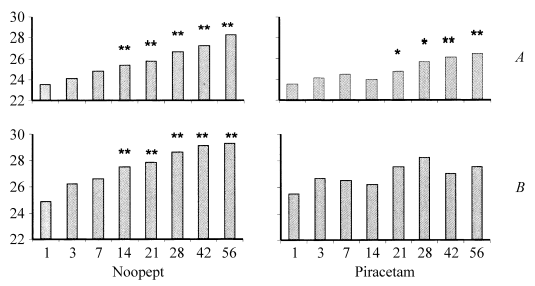 While there has been limited research on the effects of Noopept in humans, one study in humans observed the effects of Noopept in people with mild cognitive disorders.146 patients with either dependent personality disorder or post-concussional syndrome underwent treatment with either Noopept or piracetam over a period of 56 days. It was found that in both cases, Noopept helped to improve cognitive function as measured by the Mini Mental Status Examination (MMSE) before and after a 56-day administration period. In both the patients with dependent personality disorder and those with post-concussional syndrome, Noopept resulted in greater improvement in MMSE scores. Noopept was shown to improve scores on the Mini Mental Status Examination (MMSE) in patients with dependent personality disorder (A) and post-concussional syndrome. In addition, Noopept was shown to improve scores in the Cognitive Capacity Screen Examination (CCSE) in both sets of patients as well. The improved effects started to appear at 14 days after initiation of treatment and continued to increase as the treatment period went on. Noopept has been shown to improve scores on the ognitive Capacity Screen Examination (CCSE), which evalutes orientation, memory, counting, and the abilities to infer and to group objects. Significant improvemnets from baseline started appearing at 14 days after initiation of treatment. Several animal studies have examined the effects of noopept on biomarkers related to cognition. Most of these studies were conducted in animals. For example, one study showed that treatment of rats for 28 days with Noopept yielded increased expression of mRNA for brain-derived neurotrophic actor (BDNF).2However, expression of nerve growth factor (NGF) was decreased during this time. In rats, Noopept has been studied in the context of disease models for Alzheimer's. One study found that Noopept supplementation starting 15 days following injection of beta-amyloid (a molecule involved in the pathogenesis of Alzheimer's disease) in the Meynert nuclei of the brain (where neuroonal damage is known to correlate with cognitive decline), resulted in protective effects against beta-amyloid. 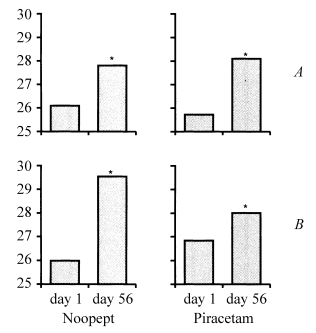 In particular, Noopept led to increased antibody production against beta-amyloid tissue.3While rats that had the beta-amyloid injection without administration exhibited memory loss, major memory loss was not found in rats treated with Noopept after injection of beta-amyloid. Noopept has not been extensively studied in humans. One study in 46 patients, had 3 patients drop out due to sleep disturbances and sharp blood pressure changes that required hypotensive treatment.1Future scientific work should focus on rigorously evaluating the safety profile of Noopept. Noopept has been shown in various cases to carry cognitive benefits. However, there is limited scientific evidence out there. Many of the studies surrounding Noopept have been conducted in Russia, with few conducted elsewhere. As well, while there are studies in vitro and in animals, there is limited work on healthy humans. Furthermore, Noopept is not classified as Generally Regarded as Safe (GRAS) by the FDA. We do not recommend the use of Noopept at this time. Neznamov, G. G., & Teleshova, E. S. (2009). Comparative studies of Noopept and piracetam in the treatment of patients with mild cognitive disorders in organic brain diseases of vascular and traumatic origin. Neuroscience and behavioral physiology, 39(3), 311-321. Ostrovskaya, R. U., Gudasheva, T. A., Zaplina, A. P., Vahitova, J. V., Salimgareeva, M. H., Jamidanov, R. S., & Seredenin, S. B. (2008). Noopept stimulates the expression of NGF and BDNF in rat hippocampus. Bulletin of experimental biology and medicine, 146(3), 334-337. Ostrovskaya, R. U., Belnik, A. P., & Storozheva, Z. I. (2008). Noopept efficiency in experimental Alzheimer disease (cognitive deficiency caused by β-amyloid25–35 injection into Meynert basal nuclei of rats). Bulletin of experimental biology and medicine, 146(1), 77-80. Ostrovskaya, R. U., Gruden, M. A., Bobkova, N. A., Sewell, R. D., Gudasheva, T. A., Samokhin, A. N., ... & Morozova-Roche, L. A. (2007). The nootropic and neuroprotective proline-containing dipeptide noopept restores spatial memory and increases immunoreactivity to amyloid in an Alzheimer's disease model. Journal of psychopharmacology, 21(6), 611-619. Ostrovskaya, R. U., Vakhitova, Y. V., Kuzmina, U. S., Salimgareeva, M. K., Zainullina, L. F., Gudasheva, T. A., ... & Seredenin, S. B. (2014). Neuroprotective effect of novel cognitive enhancer noopept on AD-related cellular model involves the attenuation of apoptosis and tau hyperphosphorylation. Journal of biomedical science, 21(1), 74.